I planned a DIY MFA review like I did for Pride & Prejudice, but I thought it might be more helpful to see how we consider books in the MFA when trying to improve writing. If you're a romance writer, comparing these two books will be very helpful for you because they are "romance classics." If you're not a romance writer, look at the comparison and imitate it using books in your genre. So here is what I think of the two books when compared. I saw Jane and Lizzy both as strong heroines. Still, Lizzy is the stronger of the two. I don’t think she would have tolerated her aunt and cousins the way Jane did. And she would have put Rochester in check a whole lot sooner. But there is a real difference in the heroes. Darcy is good looking, at times rude but still decently mannered. Darcy is a redeemable bad boy. I found nothing redeemable in Rochester. He’s not attractive. (This could have been overcome—who doesn’t love a good Beauty and the Beast story)? He’s twenty years older than her and has a wife he forgot to mention. I understand the wife is insane and the marriage a sham, but he could have been honest about it. Especially since he has his new girlfriend living in the same house as the psycho. And the psycho has at one point tried to set him—and the house—on fire with Jane in it, and at another point came into Jane’s room in a manic rage. He ignored Jane’s interest in anything but him. (He didn’t want her to be Adele’s governess anymore; Adele has to be sent away. Jane needs to dress a certain way). There is a structural difference here too. In P&P we got snippets of Darcy’s point of view and then with the letter we are given a broad scope of his mind. We never get any of Rochester’s point of few. (A poor choice because he may have been more relatable if we had seen his point of view). As I was reading this parts of it felt more like YA than romance. The books also differ in tone and mood as other people have pointed out. P&P is light contemporary romance (for Austen’s time). 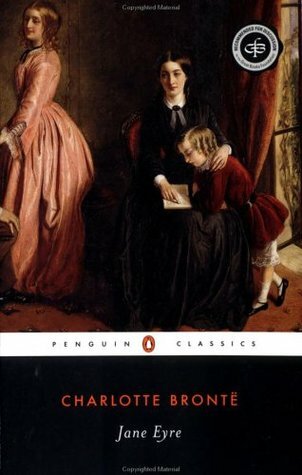 Jane Eyre has a darker tone. I didn’t particularly enjoy either book, but prefer P&P to Jane Eyre. That being said, there is one thing I think JE does better: romantic tension. P&P didn’t have enough romance for me to really love it. Mary said that by today’s standard there was “not a kiss to be had.” True enough, but when I said I felt P&P lacked romance I didn’t even mean physically. I didn’t feel enough longing. I didn’t feel Darcy tried hard enough or that Lizzy pushed him to do so. I didn’t feel the emotional tug-of-war that is romance. During the 40% of the book Rochester is around, you feel the tug of war. These characters want each other desperately—for reasons beyond my comprehension at least on her part—but still they do. Which brings us to the last question. What does JE add to the romance genre? This is tough, because while JE might satisfy Regis’ standards, I really don’t think it would sell as a romance today. In considering the influence it has had on later romances, what immediately came to mind was Twilight, a YA. While JE does is not romance by the Beth test, it can probably be credited to adding the intense emotional angst to the genre. And it may be the beginning of paranormal romance. His wife’s situation was never quite clear, but Jane did compare her to a vampire. And the ending undeniably had paranormal elements.